One of my favorite autumn delights growing up in Texas was fresh pecans. My grandmother would gather the pecans from her pecan trees and bring them on Thanksgiving unshelled to share. The family would sit around, visit cracking pecans and what we didn’t eat right from the shell, we would use for pecan pies. I miss the arrival of brown paper sacks of fresh still shelled pecans and realize as an adult what a delicacy Colorado River Bottom grown pecans are. My good friend, Ashley had her family in from Texas and they not only brought fresh Texas pecans, but also made a delicious Brown Butter Pecan Pie to share. 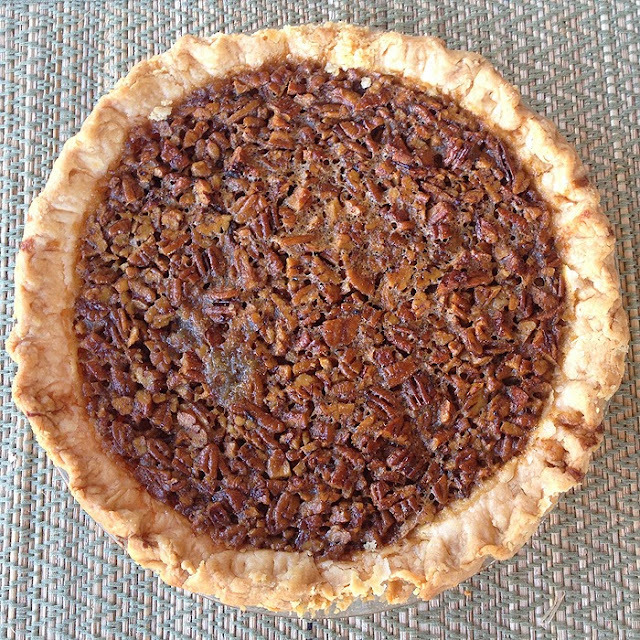 The crust was light and flaky and the filling does not overpower the taste of the pecans, but rather brings out their sweet rich nutty flavor. Take it from a Texan; it is worth sourcing good fresh pecans, cracking them yourself and baking what you don’t immediately eat. Brown butter in sauce pan until golden brown. Do not let it burn and once browned, let it cool. In separate bowl add ingredient in order listed . Stir and blend in brown butter well. Pour into unbaked pie shell. Bake at 425° for 10 minutes and then lower to 325° for 40 minutes. Mix lightly. Roll out into a thin crust. You can make many ahead of time and freeze placing wax paper and foiled between each crust.